A wooden cased portable electricity test meter. A look at a Sangamo Weston Portable Test Meter, Model 12. Contained in a wooden case with leather carry strap. The lid is missing. Inside is an electricty meter, a large transformer and a switching arrangement to select various current ratios. This was probably used for testing other electricity meters. Serial number F5882. This meter has separate terminals for potential (voltage) and current. 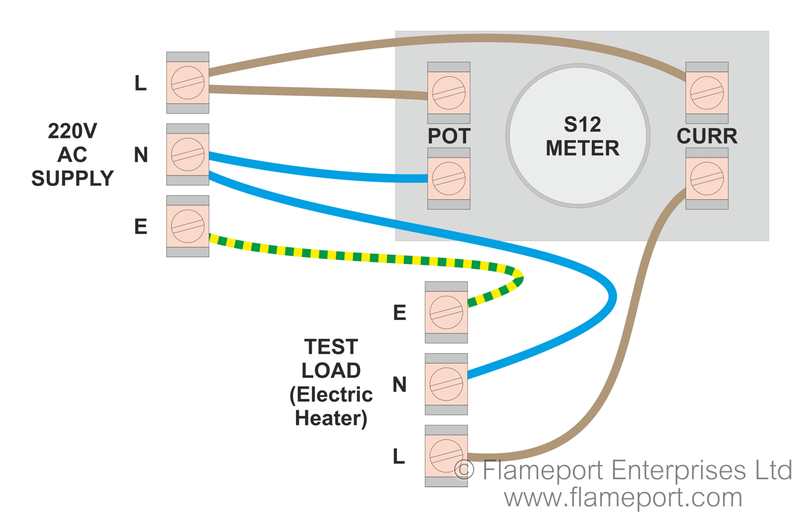 The wiring arrangement used in the demonstration video is shown here, the additional modern power meter was connected with the load (a fan heater). 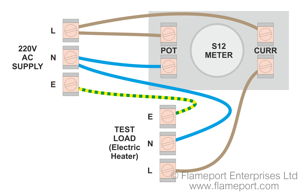 To make the test meter rotate in the oppposite direction, swap the wires connected to the CURR terminals. Alternatively swap the wires on the POT terminals. WARNING The Sangamo meter has many exposed live parts inside when in use, and even when in the case the top terminals are live at mains voltage. Do NOT attenpt a similar demonstration unless you fully understand the risks involved and have taken appropriate safety precautions.